Descrizione: Dopo un breve accenno alla vittoria degli Armagnacchi nella battaglia di Patay, ottenuta, “after the oppinon of the Frenshe Cronycle […] by Iane or Iohane, callyd in Frenshe la Puzele de Dieu”, (R. Fabyan, The New Chronicles of England and France, p. 599), la storia della Pulzella viene ripresa nel resoconto relativo all’ottavo anno di regno di Enrico VI. Il sontuoso banchetto organizzato in occasione dei festeggiamenti per l’incoronazione del sovrano ed il suo viaggio verso Calais precedono, come in molte altre cronache inglesi, le campagne militari in Francia. Il ruolo di Giovanna d’Arco si rivela in un primo determinante per i francesi, i quali riescono ad avere la meglio sugli avversari. Sua è anche l’iniziativa di attaccare gli inglesi e i borgognoni a Compiègne e, una volta catturata, la notizia della sua presunta gravidanza già annunciata nel Brut posticipa il processo e l’esecuzione. Ed Antiche: London, J. Rastell, 1533, in-fol. London, John Raynes, 1542, in-fol. London, John Kingston, 1559, in-fol. Ed. moderne: The New Chronicles of England and France, In Two Parts; by Robert Fabyan. Named by Himself The Concordance of Histories. Reprinted from Pynson’s Edition of 1516. The First Part Collated with the Editions of 1533, 1542, and 1559; and the Second with a Manuscript of the Author’s Own Time, as Well as the Subsequent Editions: Including the Different Continuations. To which Are Added a Biographical and Literary Preface, and an Index, by Henry Ellis. London, Printed for F. C. and J. Rivington; T. Payne; Wilkie and Robinson; Longman, Hurst, Rees, Orme and Co.; Cadell and Davies; J. Mawman; and J. Johnson and Co., 1811. Commento: McLaren, Mary-Rose, The London Chronicles of the Fifteenth Century: A Revolution in English Writing. With an annotated Edition of Bradford, West Yorkshire Archives MS 32D86/42, Cambridge, Brewer, 2002, pp. 26-28; pp. 263-265. Kingsford, Lethbridge Charles, M.A., English Historical Literature in the Fifteenth Century, New York, Published by Burt Franklin, 1913, pp. 99-106. 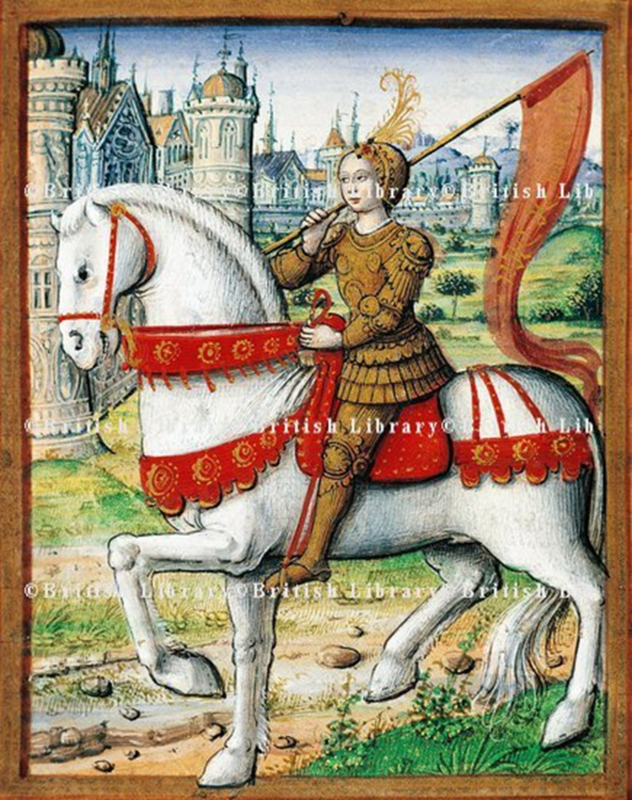 Giovanna d’Arco a cavallo, miniatura tratta dalle Vie des femmes célèbres di Antoine Dufour, XVI secolo, Musée Thomas Dobrée (Art Museum) Nantes.